So why are these rules important for a Stable Investor? It is because if you lose money on an investment, it will take a much greater return just to break even, leave alone turning profitable. 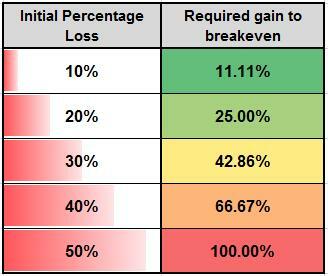 If initial loss is 20%, then an investor needs to earn 25% from lower levels just to break even. And if initial loss is 50%, then the requirement increases to a whopping 100%. So how can a stable investorreduce his chances of initial losses? Though it is difficult to predict future direction of a stock, what one can do is to stick with quality stocks trading at discounts. By following this approach, an investor may reduce his chances of landing up a multi-bagger, but this ensures that losses due to investment in speculative high growth potential stocks are reduced. Reason for the same is that high growth stocks are more volatile than larger ones. Any adverse news can significantly dent a stock’s price. But in reality, it is should be understood that we are not Warren Buffett & it is tough not to lose money in markets, even if it is for the initial periods of the investments. Next Entry SIP on Steroids – How to give boost to your regular investments?